Martha Crone begins her 23rd year as Garden Curator in the 49th year of the Garden. “What a fairyland the woods present after a snowstorm, when every tree is outlined in softest white, and every branch sparkles wherever the sunbeams rest. The new snow muffles the echoes and there is new beauty where only bare bleakness existed before. 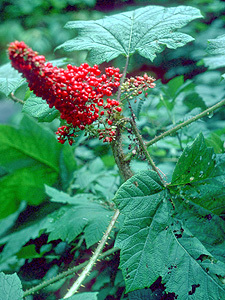 Devil’s Club or Devil’s Walking Stick (Panax horridum - now Oplopanax horridus) is a member of the Ginseng Family. The densely prickly stems grow as tall as 13 feet. Both sides of the large leaves have scattered pickles. This plant often forms extensive dense thickets and because of the sharp prickles these are almost impenetrable. It grows abundantly in the forest of the pacific slope from Oregon to Alaska, and is also found about Lake Superior as well as in Japan. . A number of plants are thriving in the Wild Flower Garden. Eloise Butler originally introduced the plant to the Garden in 1921 with plants from Isle Royal. In 1935 Martha plant more. These also came from Isle Royal via Gertrude Cram, In sending the plant to Martha, Mrs. Cram wrote “I hope you receive the Devil’s Club in sufficiently good condition to enable you to recognize it. The package was a flimsy one - there is never a box to be had here without reserving it weeks in advance - and I was not sure it would get through the mail. I put in two young plants in case you want to start a colony in your own yard or in the wild garden! It really is a handsome plant even if it is vicious.” It is uncertain how long the plants lasted but they are no longer extant. The Friends of the Wild Flower Garden held their annual meeting on Tuesday Jan. 4, 1955 at the offices of the Burma Vita Company at 2318 Chestnut Ave. West, in Minneapolis. Membership at the time was 200. It was voted to give $500 to the Board of Park Commissioners to assist in maintenance of the Wild Flower Garden. 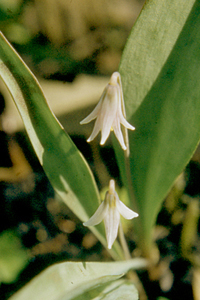 Minnesota Dwarf Trout Lily (Erythronium propullans) photographed in the Garden on April 25, 1955 by Martha Crone. Click on image for larger version. In the Spring Newsletter Vol. 3 No. 2, April 1955, Martha Crone wrote about Spring bird migration, how the date of Easter is determined, Kumquat, Regal Lily, the various pests of the Garden and of the 11 Trillium species present at that time, several of which are now gone (in 2016). On April 7, the first plants were in bloom: Snow Trillium, Hepatica, Red Maple and Skunk Cabbage. That same day she began her seasonal planting with 20 ferns - 10 Common Polypody and 10 Purple-stemmed Cliff Brake. In May Friends members received an invitation from Clinton Odell and Dorothy Binder for the first annual picnic and get-together to be held on Saturday May 14. Lunch was provided by The Friends and served at 12:15 at the Park Board shelter across the avenue from Wirth Beach. Following lunch, Martha Crone gave a tour of the Garden. On May 30th Martha Crone was interviewed on WCCO radio by Darragh Aldrick. She estimated that 10,000 people came to the Garden each Sunday in May and offered thanks to Friends member Miss Gene Dorman who helped out on busy days (1). Today, those visitation estimates seem high, but her number of 10,000 could seem more reasonable if she meant all the Sundays of May in total. 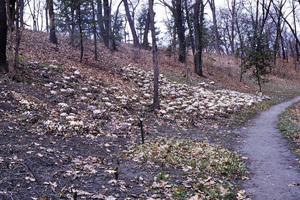 Hepatica Hill on April 17, 1955; photo by Martha Crone. One day after the photo in the section above. Sunny days make all the difference.Click on image for larger copy. During the Spring Martha planted six species that were noted in her log for the first time and these are first time in the Garden. Most are not native. Aster geyeri [Symphyotrichum laeve var. gereri] Geyer’s Aster no source listed, questionable if native, only one plant ever collected, in Lincoln County in 1891. Possibly what she had was var. laeve which is native. Maianthemum trifolium, Three-leaved Solomon’s Seal, Native, no source. While this is the first time she listed the species, but she had remarked in her diary of June 4, 1942 that a man came to the Garden to photograph the Three leaved Solomon’s Seal that she brought in from her cabin at Cedar Creek, so this was not really the first planting. 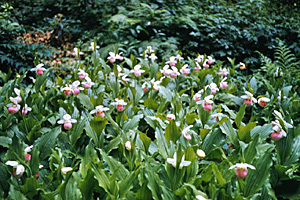 Clumps of Showy Lady's-slippers (Cypripedium reginae) in bloom; photographed on June 10, 1955 by Martha Crone. Click on image for a larger version. “The propagation of wild flowers or in other words the flowers that were here originally when white man came, is a worthwhile service to the community. Only a few varieties of wild flowers are normally found growing in any one locality. Rarely are there more than a few different sorts at anyone time in wild areas. Here is the Wild Flower Garden - in an area of only 13 acres, there is a greater variety of vegetation than can only be found in greatly scattered territories. This is the result of the introduction of hundreds of native varieties as well as many from other states which offer real advantage to the garden." 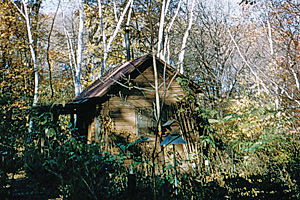 The Garden Office in the Fall; photographed on October 21, 1955 by Martha Crone. Click on image for a larger version. “When the upland or prairie garden was established ten years ago the area was a ticket of sumac and various other shrubs. These have been removed and thousands of typical prairie plants of various kinds introduced. Here the sun beats down all day and only the deep-rooted plants of the prairie will thrive. The success in growing these plants is to provide good drainage. However the annuals will not germinate readily during a dry spring and will be greatly lacking. Most perennial deep-rooted plants are best started from seed, since they are difficult to transplant. The prairie garden becomes colorful in midsummer when the spring flowers have gone and the shade in the woodland is so dense that very few plants will bloom there. Indigo Bunting, Black-capped Chickadee, White-breasted Nuthatch, Catbird, Robin, Brown Thrasher, House Wren, Blue Jay, Wood Pewee, Phoebe, Crested Flycatcher, Downy Woodpecker, Hairy Woodpecker, Pileated Woodpecker, Flicker, Ruby-throated Hummingbird, Barred Owl, Broad-winged Hawk, Ring-necked Pheasant, Red-eyed Vireo, Yellow Warbler, Northern Yellow-throat, Baltimore Oriole, Cardinal, Field Sparrow, Eastern Green Heron, Wood Duck and Goldfinch. The Blue-gray Gnatcatcher was again seen adjacent to the garden where it nested some years ago. It had not been noted in this locality for many years. Lulu May Aler wrote that the bird first appeared in the area in 1936; then in 1939 it was seen in the Garden area and it appeared again in Martha’s 1942 and 1943 diary notes. Martha added one new species in the Summer: Asclepias viridiflora, Green Milkweed, Native, from the Kasota prairie. In the Fall Newsletter (Vol. 3 No. 4, October 1955), Martha Crone wrote about the October flowers, the Ginseng Family, the Spider Flower, the Milkweed Family, and that the Hummingbird left the Garden on Sept. 8th, a week earlier than average. Cladonia rangiferina, Reindeer moss, no source given, but Eloise had also planted it in 1924 and 1927. Below: The Upland Garden in Autumn, photographed on October 24, 1955 by Martha Crone. Click on image for taller version. In her annual Friends of the Wild Flower Garden Secretary’s report (3) Martha stated there were 183 members of the Friends. Also noted was the work being done on the new Fern Garden being developed in an undeveloped part of the new Upland Garden, with funds ($775) from a gift of the Minnetonka Garden Club and the Little Minnetonka Garden Flower Club. She estimated over 75,000 visited the Garden, with mosquitoes being absent due to her new sprayer provided by the Friends and the fact that the weather was hot with extended dry spells. The year was not extraordinarily dry, but there was just over 21 inches of precipitation whereas almost 28 inches in average. Photo top of page: The Upland Garden photographed by Martha Crone on Oct. 24, 1955. Note the chain link fence that marked the Garden boundary prior to the 1944 upland addition is still in place. A section of the fence was still there in 1993 and was removed and used to fence in the 1993 one acre addition to the Upland Garden. Click on image for taller photo. Martha Crone's Annual Report to the Board of Park Commissioners dated Feb. 14, 1956 to Superintendent Charles E. Doell. Vol. 3, # 1, January 1955, Martha Crone, Editor. Vol. 3, # 2, April 1955, Martha Crone, Editor. Vol. 3, # 3, July 1955, Martha Crone, Editor. Vol. 3, # 4, October 1955, Martha Crone, Editor.